Home / Archive by Category "Cameras"
Soon after I started collecting cameras in 2011 I bought an Olympus XA. I also read that the XA2 was a decent camera so I acquired on of those too. In a box, with flash included I recall that I paid less than $10 (this was of course before the vintage film cameras started to increase in price). There’s not a lot to say about it and it’s all been said elsewhere. For example Mike Eckman has his usually extremely thorough review here. It’s very simple and very small with a clamshell design that turns the camera on when you open it. It loads easily and feels good in the hands. It has something of a “plasticky” feel, especially the film advance, which feels like something on a disposable camera. I’d never used a scale focus camera before and thought that I would have difficulties, but the Olympus implementation was quite easy to use. Just three icons (one for close up:portrait; one for middle distance:group; and one for far/infinity:landscape). It turns out that you’ll use the middle distance the most because, combined with the large depth of field from the 35mm lens this covers most possibilities. In fact when you turn the camera on it cleverly sets itself to the group setting. The viewfinder is very basic and shows only an LED showing that flash is required and another one indicating that a slow shutter speed is being chosen. Other than that only the bright line is displayed i.e. no aperture, shutter speed or focus distance information. ISO is set manually and exposure is fully automatic. I rather liked the camera: its size, portability, ease of use. It’s a great carry around everywhere camera and the scale focus turned out to be much easier than I thought. The only thing that I didn’t like is also shared with other cameras in this line (including the fabled XA): the extremely sensitive shutter release. It’s far to easy to trip the shutter by mistake. I must remember to keep the camera closed until I need it and to keep my finger away from the shutter release until I’m ready to take the shot. This is one solid camera. It’s big and heavy, but at the same time feels quite comfortable in my hands. The exposure system is intriguing. For fully automatic exposure you set both the aperture and shutter speed to ‘A’ and shoot away (or at least I hope you do. I still waiting for results). For unusual conditions or for special effects and techniques, you may want to operate the camera manually selecting the shutter speed and aperture yourself. 1) Move the “A” marks away from the “arrow” by pressing the AUTO release button (on the right side of the lens) and turning the shutter speed ring. Then, press the button once again in order to disengage the diaphragm ring. 2) You are now in complete command of the camera (just as with any fine 35mm camera) and can set any shutter speed or aperture opening combination you wish. Of course you’ll need to have an instinctive grasp of exposure, follow the the “sunny 16“ rule or use an external meter for this to work. Even after disengaging the automatic system you can, if you wish, use it as and independent exposure meter. 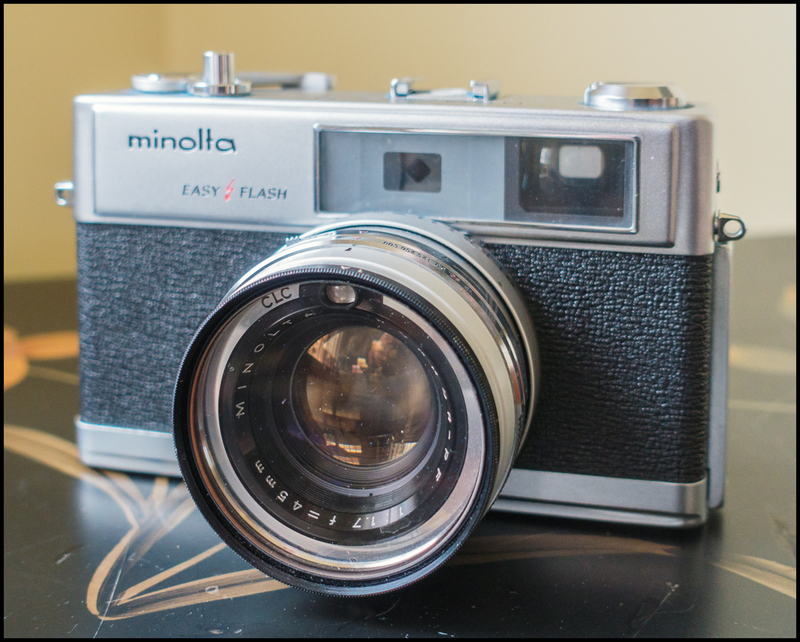 When using the Minolta Hi-matic in this way, aim at your subect, and watch the point to which he indicator needle moves on the EV scale. Set this EV number in the EV window on the lens barrel. 1) Press the AUTO release button and set any shutter speed you wish. 2) Read the EV figure indicated by the needle in the viewfinder. Then set the figure in the EV window by turning the diaphragm ring 3) You may also set the aperture opening first and then move the shutter speed ring to obtain the correct EV number. It all sounds a bit “fiddly” and I haven’t yet plucked up the courage to try this method (for my first roll I used fully automatic operation). The lens is a Minolta Rokkor PF f1.7 45mm and if it’s like other Rokkor lenses I’ve used it will be a good performer. Focus is via a tabbed ring on the lens barrel and the coupled rangefinder is well defined in quite a large and clear viewfinder. Loading is much as you would expect except for one unexpected useful feature: a small window that shows you if the film has loaded properly and is advancing correctly. The film advance level has rather a long throw (which doesn’t bother me much) and the shutter release requires quit a lot of pressure (which does bother me. I wouldn’t be surprised if I got some blurry pictures as a result of camera shake). As with many fully automatic exposure camera it bothers me that I don’t know what aperture and shutter speed settings the camera has chosen. I suppose if I really want to know I can set them myself using either the fully manual or semi-automatic modes described above. I’ll try these modes for the next roll. The camera came with one of the least objectionable every ready cases I’ve come across. It was in very good condition and it was easy to remove the entire front half leaving only a half case, which didn’t get in the way of picture taking. All in all I really liked this camera and I’m looking forward to seeing the results. For a more thorough review see this one on K2 photography. I’ve mentioned in a number of earlier posts that my wife loves blue and white china. She collects it and also administers a group on Facebook devoted to it. I recently came across the perfect present for her. Presently it’s available on ebay, which is also the source for this picture and ebay user samprivet. 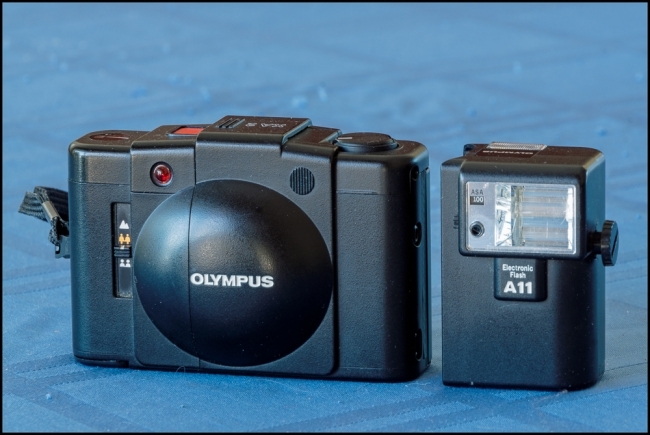 He also has a red one similarly based and a Zorki 4 as well as another blue one based on a Fed 3. In an earlier post I mentioned that I’d acquired a Nikon D80, mostly because I wanted to see what it was like to use a Nikon Digital camera. Well – I’ve done it again. The Canon 5D Classic – A Review by Ray Goodwin. $76 Full Frame! – 5 Reasons to Buy a Canon 5D Classic in 2018. 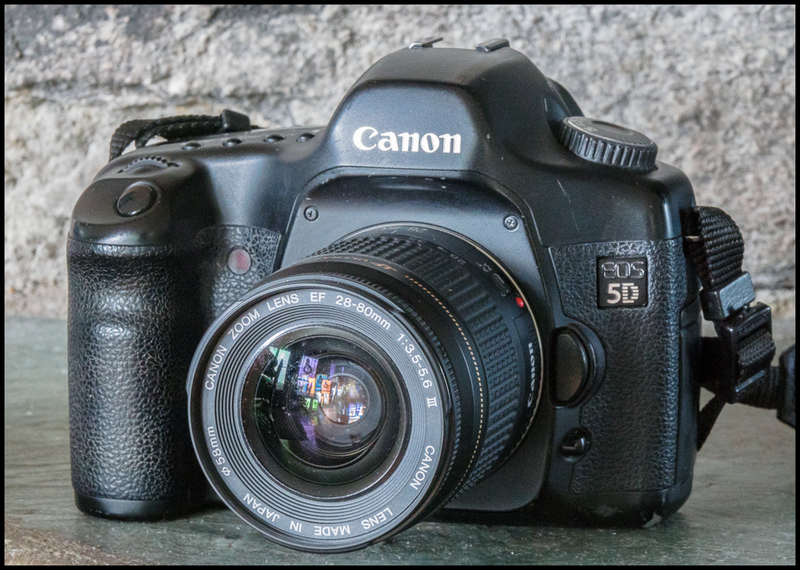 5 reasons why you should a Canon 5D Classic. I’d always fancied having a full frame camera, but the recent generation models just cost more than I wanted to pay. I even took a look at the Nikon D700 and the Canon 5D Mark II (notice that the photographic community now seems to refer to the original 5D as the “Canon 5D Classic) – still too expensive. So back to the original 5D. I managed to find one at a price that I could tolerate and decided to get it. I had a few Canon EF lenses from film cameras I had acquired earlier and figured that I could use them to see whether or not I liked the camera. Ultimately, it’s my view that if you’re looking for a cheap entrance into the world of full frame DSLRs, you can’t beat the Canon 5D Classic in terms of image quality, lens selection, and catching an outright bargain. The mixture of the beautiful sensor and the film-camera-feel makes it a compelling camera to use. It’s served me rather well over the last couple of years, and I intend to use it until it’s dying day; I really feel as it’s in a class of it’s own. Less really is more, the Canon 5D Classic is a perfect example of this! I couldn’t agree more. Yes, it has a lower resolution sensor. Yes, its autofocus is primitive. Yes, the lcd is appalling. 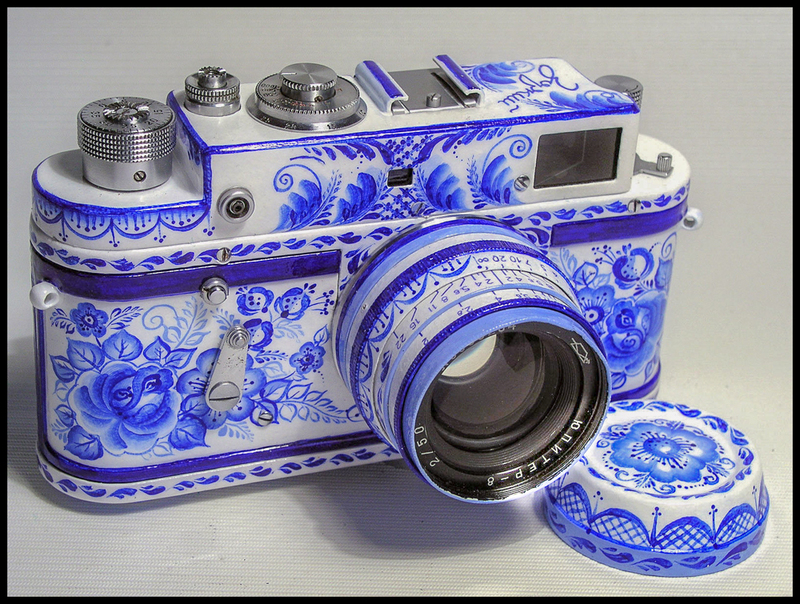 In many ways it’s rather primitive compared to current generation cameras. But, and it’s a very big but, there’s something rather wonderful about this camera. Most of the reviews I read point out that it has a very ‘filmic’ feel. I’ll go a bit farther and say that to me this camera has come the closest of any digital camera I’ve tried to giving a film photography feel. The files it produces have a very film like look and the whole shooting experience it more like shooting a film camera than a digital. I love it! (Although it should said that I don’t do action photography so I don’t need super-sophisticated autofocus (in fact I have trouble understanding all of the autofocus options on my Sony A77II). Nor do I make very large prints. I don’t “chimp” very much. So most of the disadvantages of this camera don’t affect me all that much. A view from Spur Beach. The last of the fall colors. Autumn light over the lake. The other day my wife wanted to go to a nearby Goodwill store to look for some pots. While we were there I took a look around. 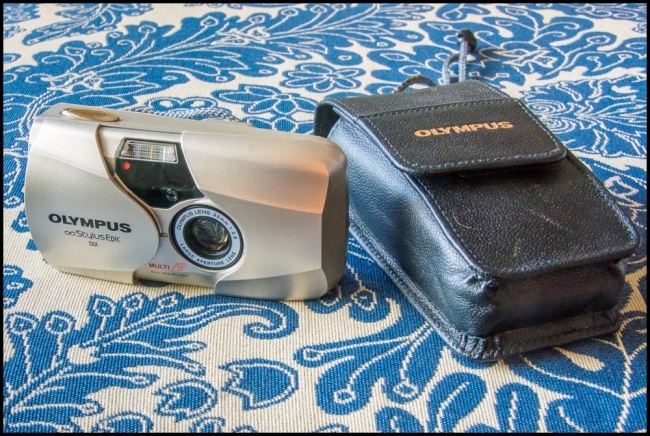 At first I didn’t see anything of interest – just one broken 1980s vintage point and shoot. Then at the back of a bin I noticed a case, possibly empty, possibly not. I took it out and had a look and, lo and behold, an Olympus Infinity Stylus Epic DLX! Since I already have two why get another one? First the cameras that I have, while functioning well, leave a lot to be desired cosmetically. This one also appears to function perfectly (hopefully it won’t be plagued with the light leaks that tend to affect the Infinity Stylus line), but also is in near mint condition. Second it’s hard to ignore a camera that costs $5.99 (actually less. When my wife paid she got them down to $3.00) and sells at the moment on ebay for around $200.